I don’t know if this will be big enough for you to read, I hope so. Apart from the fact that I’m not open to the public apart from at Spring Fling and that Jason is helping me build a kiln not building it for me, it’s a great piece of publicity, and the picture isn’t too awful either. 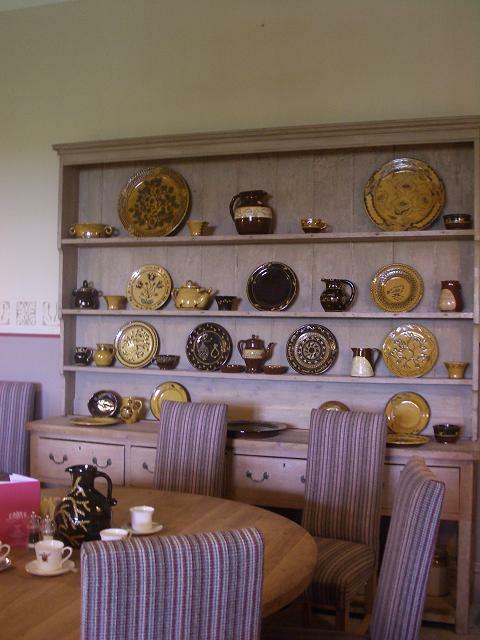 This dresser is at Dumfries House, I’ve just been up there this morning to deliver some more work, they now have a jug of mine on each of the tables in this room . You can see a couple of pieces of Cumnock ware on the dresser amongst my pots. It’s strange seeing my work outside of the workshop. Those plates on the top, the tree and the daisies, in my workshop look huge, they are as big as I can make plates and look at them, saucers in that setting. They look good though. Hopefully there’ll be some better pictures once the place is properly finished, it’s great seeing them in such a setting. A funny year this year so far, a year full of rejection letters, just got a couple more this week, I could paper my house in them now I think, in amongst that though I have an acceptance for Ceramics in the City at the Geffrye Museum again in September which is great because I do enjoy that show and an exhibition coming up at Cambridge Contemporary Art Gallery. Applying for shows and exhibitions is a really hard thing. You just keep on doing it and hoping for the best, this year I thought I had good photographs of some of the best pots I’ve ever made but obviously they aren’t what a lot of the selectors are looking for for their shows this year. Never mind, I’m nothing if I’m not a stubborn determined person so I’ll just be trying again next year. 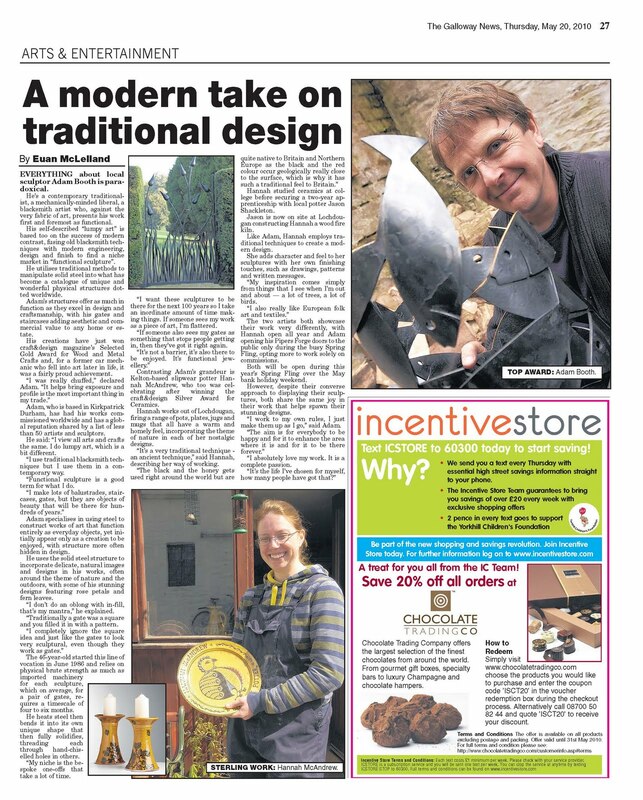 This entry was posted in Cambridge Contemporary Art, Cumnock Pottery, Dumfries House, The Galloway News. Bookmark the permalink. Article: A very cheerie photo of yourself . Article reads well if you enlarge print. I'm glad you're doing C in the C again -I got in too but got rejected from Origin this year (which is only a week after C in the C) and I thought they were the best images I'd had so far. You just have to keep going and try applying for everything.